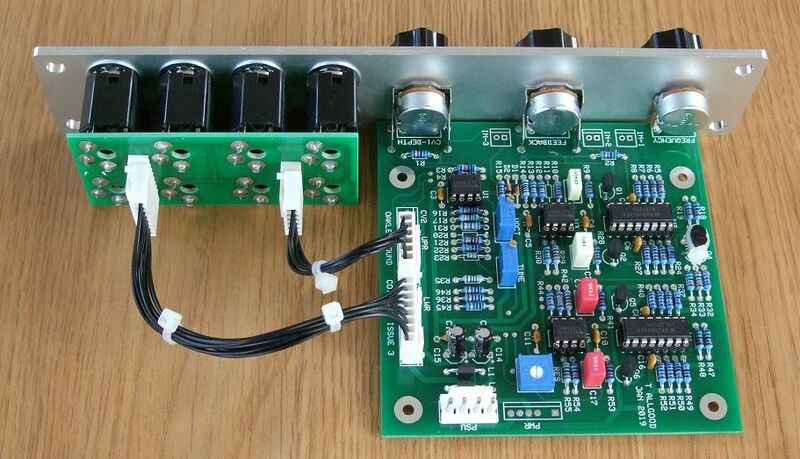 This is a four pole multimode filter capable of -24dB/octave low pass, -12dB/octave low pass and +/-6dB/octave bandpass outputs simultaneously. The filter core is based on four identical cascaded current controlled integrators. This is similar to the topology found on the filters in the SH series of monosynths as well as the CEM3320, IR3109 and SSM2040 filters of the classic polyphonics. At high resonance, we call it 'feedback', the COTA VCF will oscillate well over the whole of the audio band with a clean sinewave. Its temperature compensated too. The module also features a feedback input. This is similar to the one we introduced in the groundbreaking Multiladder module. In conjunction with the 24dB/octave output this input allows the resonance signal path to be split. This means that additional modules can process the resonance loop independentally. This allows a large variety of new timbres to be created. And it also allows for voltage controlled resonance with the use of an extra single VCA module. The design is intended to fit into a 1U wide 'filter-core' module or a more fully featured 2U wide panel with seven control pots. The 1U 'Filter Core' format is our way of handling filter modules. Although the 1U module can be used as a filter module on its own, it is expected that users will make use of external mixers to control CV and audio levels going into the filter. In this way, you will be able to have a collection of space saving 1U filter cores that can be used with any generic mixer module. The Oakley Multimix is an ideal choice for a handy mixer module. For the 2U design three audio inputs are provided each with its own attenuator. Three CVs can control the cut-off of the filter. One is fixed at 1V/octave, the other two have input attenuators. CV1 features a reversible type attenuator with inverting/non-inverting properties. Power (+/-15V) is provided to the board either by our standard Oakley 4-way header or Synthesizers.com header. The board size is 104 mm (high) x 104 mm (deep). Current draw is around 20mA per rail. The issue 3 filter core version of the COTA VCF in a natural finish Scheaffer panel. Note the optional Sock8 socket board used for easier construction. Using the -24dB/octave low pass output. Simple 16 note sequence with an input from the sawtooth output of a single Oakley VCO. The filter is manually being swept via the 'freq', 'resonance' pots and altering ADSR sweep depth. Using the BP output. Another simple 16 note sequence. Using the -12dB/octave output. Another simple 16 note sequence. Using the -24dB/octave output. Another simple 16 note sequence making use of lots resonance to show how squelchy this one can get. Using the -24dB/octave output. Lots of little blips, bleeps and cheesy riffs. The following two samples use the same equipment as above but add a Oakley Overdrive module at the output of the COTA. More overdrive with the COTA set to highish resonance and swept with an ADSR, firstly on slow attack, then quicker. Click here for how to order. The optional Pot Bracket Kit contains the two 16mm Alpha pot brackets required to complete one module. All other parts can be purchased from you usual electronic component supplier. All prices include VAT at UK rates. Shipping and postage is additional to these prices. Click here for full price list and ordering details. See also the FAQ page. COTA ready made modules may be available from Krisp1.com. Schematics are only available to purchasers of the PCB and will be sent via e-mail when the board(s) are shipped. To read these files you will need a copy of 'Frontplatten designer' from Schaeffer. The program also features on-line ordering, so its now even easier to buy your panels from Scheaffer. The company are based in Berlin in Germany and will send out panels to anywhere in the world. Delivery to the UK normally takes around ten days. For North American users you can also order your Schaeffer panels from Front Panel Express. Last revised: February 28, 2019.